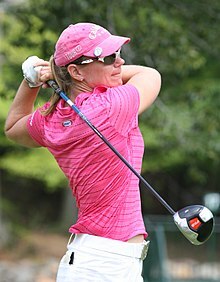 Annika Sörenstam (pronounced [ˈanːɪka ²sœːrɛnˌstam] ( listen); born 9 October 1970) is a retired Swedish American professional golfer. She is regarded as one of the best female golfers in history. Before stepping away from competitive golf at the end of the 2008 season, she had won 90 international tournaments as a professional, making her the female golfer with the most wins to her name. She has won 72 official LPGA tournaments including ten majors and 18 other tournaments internationally, and she tops the LPGA's career money list with earnings of over $22 million—over $2 million ahead of her nearest rival while playing 149 fewer events. Since 2006, Sörenstam has held dual American and Swedish citizenship. The winner of a record eight Player of the Year awards, and six Vare Trophies given to the LPGA player with the lowest seasonal scoring average, she is the only female golfer to shoot a 59 in competition. She holds various all-time scoring records including the lowest season scoring average: 68.6969 in 2004. Representing Europe in the Solheim Cup on eight occasions between 1994 and 2007, Sörenstam was the event's all-time leading points earner until her record was surpassed by England's Laura Davies during the 2011 Solheim Cup. In 2003, Sörenstam played in the Bank of America Colonial tournament to become the first woman to play in a PGA Tour event since 1945. Born in Bro near Stockholm, Sweden, Sörenstam's father Tom is a retired IBM executive and her mother Gunilla worked in a bank. Her younger sister Charlotta is a professional golfer who coaches at her sister's academy. Annika and Charlotta Sörenstam are the only two sisters to have both won $1 million on the LPGA. As a child, Sörenstam was a talented all-round sportsgirl. She was a nationally ranked junior tennis player, played association football (soccer) in her hometown team Bro IK, and was such a good skier that the coach of the Swedish national ski team suggested the family move to northern Sweden to improve her skiing year round. At the age of 12, she switched to golf, sharing her first set of golf clubs with her sister—Annika got the odd numbered clubs and Charlotta the even—and earned her first handicap of 54. She was so shy as a junior she used to deliberately three-putt at the end of a tournament to avoid giving the victory speech. The coaches noticed and at the next tournament both the winner and the runner-up had to give a speech. Sörenstam decided that if she were going to have to face the crowd anyway she might as well win and the deliberate misses stopped. Her successful amateur career included a win in the St. Rule Trophy played at St. Andrews and a runner-up finish in the Swedish national mother/daughter golf tournament. As a member of the Swedish National Team from 1987 to 1992, she played in the 1990 and 1992 Espirito Santo Trophy World Amateur Golf Team Championships, becoming World Amateur champion in 1992. While waiting to start college in Sweden, Sörenstam worked as a personal assistant at the Swedish PGA and played on the Swedish Ladies Telia Tour, winning three tournaments during 1990/1991. After a coach spotted Sörenstam playing in a collegiate event in Tokyo, she moved to the U.S. to play college golf at the University of Arizona in Tucson. She won seven collegiate titles and in 1991, became the first non-American and first freshman to win the individual NCAA Division I Championship. Sörenstam was 1991 NCAA Co-Player of the Year with Kelly Robbins, runner-up in the 1992 NCAA championship, 1992 Pac-10 champion and a 1991–92 NCAA All-American. She qualified for the U.S. Women's Open at Oakmont in July, made the cut, and tied for 63rd. A few weeks later at the U.S. Women's Amateur at Kemper Lakes near Chicago, she was the runner-up to Vicki Goetze, bogeying the last hole in the 36-hole final. Sörenstam turned professional in 1992, but missed her LPGA Tour card at the final qualifying tournament by one shot, and began her professional career on the Ladies European Tour (LET), formerly known as the WPGET. She was invited to play in three LPGA Tour events in 1993, where she finished T38th, 4th, and T9th, earning more than $47,000. She finished second four times on the Ladies European Tour and was 1993 Ladies European Tour Rookie of the Year. By tying for 28th at the LPGA Final Qualifying Tournament she earned non-exempt status for the 1994 season. Sörenstam's first professional win came at the 1994 Holden Women's Australian Open on the ALPG Tour. In the United States, Sörenstam was LPGA Rookie of the Year, had three top-10 finishes including a tie for second at the Women's British Open and made her Solheim Cup debut. Her breakout year was 1995, when she won her first LPGA Tour title at the U.S. Women's Open. She finished at the top of the Money List and was the first non-American winner of the Vare Trophy. She became the second player ever to be Player of the Year and Vare Trophy winner the year after being Rookie of the Year. A win at the 1995 Australian Ladies Masters and two other wins on the Ladies European Tour put her top of the LET Order of Merit and made her the first player to top both the European and LPGA Tour money lists in the same season. Her success worldwide resulted in her winning the Jerringpriset award in Sweden, the country's most prestigious award in sports as well as being awarded the Svenska Dagbladet Gold Medal. 1996 saw Sörenstam win her home LET tournament, the Trygg Hansa Ladies' Open in Sweden and three LPGA tournaments including the U.S. Women's Open. In defending her title, she became the first non-American to win back to back U.S. Women's Open titles, passed the $1 million mark in LPGA career earnings, and won her second consecutive Vare Trophy. She won six tour events in 1997, regaining the money list and player of the year titles. Internationally, she won on the JLPGA and defended her home LET title at the renamed Compaq Open. She became the first player in LPGA history to finish a season with a sub-70 scoring average of 69.99 en route to retaining the 1998 Player of the Year and Money List titles as well as winning the LET Swedish tour stop for the third time running. September 1999 saw Sörenstam change her on-course team replacing her caddie of six years, Colin Cann, with Terry McNamara. At this point in her career, Sörenstam says she lost focus having reached her biggest goals. Karrie Webb became the best LPGA Tour player but Sörenstam still managed to win more LPGA tournaments than any other LPGA Tour player during the 1990s. She qualified for the World Golf Hall of Fame when she won the 2000 Welch's/Circle K Championship, but was not eligible for induction until finishing her tenth year on the LPGA tour in October 2003. Sörenstam was the first international player to be inducted into the Hall of Fame through the LPGA criteria. Having lost her preeminent position, Sörenstam embarked on a new five-day-a-week exercise program including weight-lifting and balance work which by 2003 added over 20 yards (18 m) to her driving distance. During the 2001 season, she had eight LPGA wins, became the only female golfer to shoot a 59 in competition and the first LPGA player to cross the $2 million mark in single-season earnings. She set or tied a total of 30 LPGA records en route to regaining the Vare Trophy and winning her fourth Player of the Year and Money List titles in 2001. In a made-for-TV alternate shot competition between the two best male and female players in the world, Sörenstam and Tiger Woods beat Karrie Webb and David Duval. At the end of that season Karrie Webb said she "would eat her hat" if Sörenstam repeated her eight wins in 2002. Sörenstam accomplished that feat, joining Mickey Wright as the only players to win 11 LPGA tournaments in one season, earning her fifth Player of the Year title and fifth Vare Trophy. She successfully defended the Kraft Nabisco Championship, her fourth major victory, and also won the ANZ Ladies Masters in Australia and Compaq Open in Sweden on the Ladies European Tour giving her 13 wins in 25 starts worldwide in 2002. Sörenstam was invited to play in the PGA Tour's Bank of America Colonial golf tournament in Fort Worth, Texas, in May 2003, making her the first woman to play in a PGA Tour event since Babe Zaharias, who qualified for the 1945 Los Angeles Open. Vijay Singh, fourth in the world rankings at the time, criticised her invitation, saying that she should have to qualify like the men and that he did not want to be beaten by a woman. Cheered through each hole, she shot five over par, tying for 96th out of the 111 who finished the first two rounds. After shooting 1-over-par 71 in the first round, finishing in 73rd and on pace to challenge for a weekend spot, Sörenstam said she was nervous all day but pleased by her performance. In the first round she led the field in driving accuracy, was in the top 20 in greens in regulation, and was 84th out of 111 in driving distance. Poor putting (last in the field, averaging over a two-putt) caused her to miss the cut. Later in the 2003 season, she won the LPGA Championship and the Women's British Open, becoming only the sixth player to complete the LPGA Career Grand Slam. She had five other victories worldwide, set or tied a total of 22 LPGA records and earned her sixth Player of the Year award. She competed against Fred Couples, Phil Mickelson and Mark O'Meara in the 2003 Skins Game, finishing second with five skins worth $225,000; Sörenstam holed a 39-yard (36 m) bunker shot on the ninth hole—the eighth eagle in Skins Game history. In September, she was part of the winning European Solheim Cup team in her native Sweden. She was awarded her second Jerringpriset award in Sweden plus the 2003 Golf Writers' Trophy by the Association of Golf Writers. Sörenstam's dominance continued in 2004 with her seventh LPGA Player of the Year award tying Kathy Whitworth for the most in LPGA history. She posted 16 top-10 finishes in 18 LPGA starts, including eight wins, had two additional international wins, became the first player to reach $15 million in LPGA career earnings and took her own LPGA single-season scoring average record to 68.69696, but played too few rounds to win the Vare Trophy. The Women's Sports Foundation gave her the 2004 Sportswoman of the Year Award, and the Laureus World Sports Academy named her World Sportswoman of the Year. She also released a combination autobiography and golf instructional book, Golf Annika's Way. Sörenstam's life both on and off the golf course changed in 2005. In February, she announced that she had filed for divorce from David Esch, her husband of eight years, and this was finalised in August but it did not adversely affect her golf. Her achievements included being the first player in LPGA history to win a major three consecutive years at the LPGA Championship and the first golfer in LPGA or PGA history to win the same event five consecutive years at the Mizuno Classic. 11 wins in 21 tournaments entered worldwide included victory in the Scandinavian TPC hosted by Annika where she presented herself the trophy, giving her an eighth Money List title, tying the LPGA record, an eighth Rolex Player of the Year (POY) award (a record) and a sixth Vare Trophy. She is the only LPGA player ever to win Money List, POY award and Vare trophy in the same year in five different years. Team competition saw her make her seventh consecutive Solheim Cup appearance, her 4 points making her total 21, the event's all-time leading points earner, and the inaugural Lexus Cup was played with Sörenstam as the Captain of the victorious International Team. When the first-ever official Women's World Golf Rankings were unveiled in February 2006, Sörenstam was confirmed as the number-one player in women's golf, a position she relinquished to Lorena Ochoa on 22 April 2007. In partnership with Liselotte Neumann in team Sweden, she won the Women's World Cup of Golf, opened her LPGA season with a defence of her title in the MasterCard Classic. She then went winless in eight starts, causing some to talk of a slump. Her winning drought ended at the U.S. Women's Open, where she won an 18-hole playoff over Pat Hurst for her tenth major championship title, tying her for third on the list of players with most major championship titles. She totalled 3 wins on the LPGA and two on the Ladies European Tour, the inaugural Dubai Ladies Masters and the Swedish tournament she hosts, which she defended in her home town at the course where she learned to play. Her International team lost the second Lexus Cup competition to Team Asia. Sörenstam started 2007 by losing a playoff while defending of her MasterCard Classic title. At the Kraft Nabisco Championship she shot her highest 72-hole score in a major in nine years, a result explained by her subsequent diagnosis with ruptured and bulging discs in her neck, the first major injury in Sörenstam's 13-year LPGA career. After a two-month injury rehabilitation break, Sörenstam returned as the Ginn Tribute tournament hostess where she admitted to being at only 85% fitness and finished tied for 36th place. She was still not fully fit in her next two tournaments, the LPGA Championship where she finished tied for 15th place, and the US Women's Open, where, as defending champion, she finished tied for 32nd. After an early round defeat at the World Matchplay Championship, Sörenstam finished sixth at the Evian Masters, 16th at the Women's British Open and ninth in the Swedish tournament she hosts on the Ladies European Tour. On her return to the US, Sörenstam had three top ten finishes but missed the weekend at the season closing ADT Playoffs for the second year running. However, Sörenstam did win a worldwide title at the Dubai Ladies Masters on the Ladies European Tour in November 2007. Declaring herself recovered from injury and ready to return to a complete season of competitive golf in 2008, Sörenstam opened the year at the SBS Open at Turtle Bay where she captured her 70th LPGA Tour victory and first since September 2006. She won next at the Stanford International Pro-Am in April then following a week off, won again at the Michelob ULTRA Open at Kingsmill in a tournament record score, giving her three wins and over $1 million in earnings by mid-May. It was her 72nd and final ever win on the LPGA Tour. In 2008, Sörenstam was highly critical of other female golfers who tried to play in the PGA Tour – her comments to Michelle Wie for playing on the men's tour: "I really don't know why Michelle continues to do this. We have a major this week and, if you can't qualify for a major, I don't see any reason why you should play with the men." On 13 May 2008, Sörenstam announced at a press conference at the Sybase Classic that she would "step away" from competitive golf at the conclusion of the 2008 season. That night, she threw out the first pitch of the Washington Nationals/New York Mets baseball game at Shea Stadium in New York and the following day read the Top Ten on the Late Show with David Letterman. Her last tournament victory came in a playoff at the Suzhou Taihu Ladies Open, an event co-sanctioned by the Ladies European Tour and the Ladies Asian Golf tour. Her last scheduled tournament on the LPGA Tour was the season-ending ADT Championship in November, where she failed to make the weekend play in the event's unique playoff structure. Her final sanctioned LPGA appearance was as the winning captain of Team International at the 2008 Lexus Cup in Singapore. Her last professional tournament was the Dubai Ladies Masters on the Ladies European Tour in December 2008, where she finished tied for 7th. Sörenstam began the transition from professional golfer to entrepreneur during the later years of her career, attempting to combine golf, fitness and charitable works into various businesses under the ANNIKA brand with the brand statement "Share my Passion". They are all promoted by her website on which there is a blog to which she and her staff regularly contribute. Sörenstam has undertaken a number of golf course design projects. Her first, the Annika Course, was completed at Mission Hills Golf Club in Shenzen, China, in 2003; the second was officially launched in January 2006 and opened in 2008 at Euphoria Golf Estate & Hydro in South Africa. She recently announced a new project at Mines Golf City, near Kuala Lumpur, Malaysia. Projects closer to home include a redesign of the Patriots Point Links Course near Charleston, South Carolina and a course at Red Mountain Resort, British Columbia. She and Jack Nicklaus lost out on their bid to build the Olympic golf course in Rio to Gil Hanse and his consultant Amy Alcott. In 2010, a golf course at Golden Bay Resort was opened in South Korea. She designed this golf course, and Hanhwa Hotels & Resorts Corporation developed. This was the first project for her after-retirement golf course design. In an interview with CNN in October 2017, Sorenstam spoke about the difficulties of being a woman in the golf course design industry, saying that a common stereotype is that courses she designs will be 'short and easy'. The ANNIKA Academy at Ginn Reunion Resort in Reunion, Florida began construction in 2006 and opened in April 2007 with Sörenstam's longtime coach Henri Reis serving as head instructor, her sister Charlotta an instructor and club fitter, her personal trainer Kai Fusser focusing on overall fitness training, and with Sorenstam available for coaching on certain golfing packages. The opening ceremony included a Make-A-Wish Foundation golf clinic conducted by Sörenstam who is a United States ambassador for the Make-A-Wish Foundation and it also hosted clinics for junior golfers during The Annika Invitational, an American Junior Golf Association invitation-only event featuring the top 60 girls from around the world hosted by The ANNIKA Foundation. Other branches of the ANNIKA business include a clothing line with Cutter & Buck, a limited label wine produced in partnership with Wente Vineyards, and a signature fragrance developed by SA Fragrances. Sörenstam also hosted the Ginn Tribute Hosted by Annika, an event on the LPGA Tour in 2007 and 2008, and the Scandinavian TPC hosted by Annika on the Ladies European Tour during its last four years from 2005 through 2008. She won the latter tournament in 2005 and 2006. Both tournaments had their last event in 2008. One of Sörenstam's hobbies is cooking. She has participated in cooking demonstrations during LPGA tournaments and has talked about enrolling in cooking school. Before the 2003 season Sörenstam took the opportunity to improve her culinary skills by working eight-hour shifts in the kitchens of the Lake Nona Country Club. Sörenstam has had a serious interest in investments, real estate and the stock market since she earned her first LPGA check and in August 2006 was invited to ring the closing bell at the New York Stock Exchange. Sörenstam has been described as an atheist. She met her first husband David Esch in 1994 on the driving range at Moon Valley Country Club, Phoenix, Arizona, where she was an LPGA rookie practicing for a tournament and he worked for club manufacturer Ping. They were engaged at the 1995 Evian Masters, married in Lake Tahoe on 4 January 1997, and were divorced in 2005. In August 2007 she became engaged to Mike McGee, the managing director for the ANNIKA brand of businesses and son of former PGA Tour and Champions Tour player Jerry McGee. They married at Lake Nona Golf & Country Club in Orlando, Florida, on 10 January 2009. Their daughter Ava Madelyn McGee was born 1 September 2009. On 21 March 2011, Sörenstam gave birth to a son, William Nicholas McGee, nine weeks premature. Ladies European Tour Majors are shown in bold. The Evian Masters is classified as a major by the LET but not the LPGA Tour, and along with the Women's British Open is co-sanctioned by the LPGA Tour, with wins counting for both tours. On 12 January 2009, Sörenstam, who was ranked third the previous week despite having announced her retirement effective at the end of the 2008 season, was removed from the rankings. No official explanation was given for her removal. Sörenstam later posted in her personal blog that she asked to be removed. In February 2015 she became one of the first female members of the Royal and Ancient Golf Club of St Andrews. ^ a b "Official Career Wins" (PDF). LPGA (Ladies Professional Golf Association). Archived from the original (PDF) on 25 January 2007. Retrieved 7 March 2007. ^ "LPGA Tour Career Money List". LPGA Tour. Retrieved 5 December 2016. ^ "U.S. Women's Open Championship Post-Championship Interview 2006". ASAP Sports. 3 July 2006. Archived from the original on 12 December 2008. Retrieved 15 December 2008. ^ "Charlotta Sörenstam Profile". LPGA. Archived from the original on 11 March 2007. Retrieved 7 March 2007. ^ a b "Sorenstam designs new mountain golf course". LPGA. Retrieved 31 January 2009. ^ a b "Sörenstam opens new "Annika Academy"". Golf Today. 17 April 2007. Retrieved 9 May 2007. ^ "St Rule Trophy". St. Andrews Links. 23 October 2006. Archived from the original on 19 February 2007. Retrieved 7 March 2007. ^ a b Kindred, Dave (2000). "Finally, sisters in arms- Charlotta Sörenstam and Annika Sörenstam". Golf Digest. Archived from the original on 30 March 2005. Retrieved 6 July 2007. ^ "World Amateur Team Championship Record Books". International Golf Federation. Retrieved 7 March 2007. ^ "Notable Past Players". International Golf Federation. Archived from the original on 22 April 2007. Retrieved 24 March 2007. ^ Elling, Steve (6 March 2007). "Sörenstam needs balance to hold off competition". CBS Sportsline. Archived from the original on 1 December 2008. Retrieved 7 March 2007. ^ "Annika Sörenstam 1989". Golfdata Sweden. Retrieved 7 March 2007. ^ "Annika Sörenstam 1990". Golfdata Sweden. Retrieved 7 March 2007. ^ "Annika Sörenstam 1991". Golfdata Sweden. Retrieved 7 March 2007. ^ "Women's Golf History". ESPN. 26 May 2008. Archived from the original on 1 March 2009. Retrieved 17 February 2009. ^ "PAC 10 Women's Golf" (PDF). PAC10. Retrieved 7 March 2007. ^ "IMG Speakers Annika Sörenstam". IMG Speakers. Archived from the original on 17 October 2006. Retrieved 16 September 2008. ^ a b "U.S. Women's Amateur champions". USA Today. 4 August 2001. Retrieved 3 June 2008. ^ "Goetze wins U.S. Amateur". Rome News-Tribune. Georgia. Associated Press. August 16, 1992. p. 5B. ^ "Golf: U.S. Women's Amateur". Eugene Register-Guard. Oregon. August 16, 1992. p. 8G. ^ a b "2010 LPGA Bio" (PDF). LPGA. Archived from the original (PDF) on 29 June 2011. Retrieved 15 December 2010. ^ a b c "Annika Sörenstam Player Profile". LET (Ladies European Tour). 23 January 2006. Archived from the original on 12 March 2007. Retrieved 15 March 2007. ^ "1994 Holden Women's Australian Open Golf Championship". ALPG Tour. Archived from the original on 12 February 2007. Retrieved 7 March 2007. ^ "1990–2003 Solheim Cup Teams" (PDF). LPGA. Archived from the original (PDF) on 16 June 2007. Retrieved 8 March 2007. ^ a b "Annual Money Leaders" (PDF). LPGA. Archived from the original (PDF) on 25 January 2007. Retrieved 16 March 2007. ^ a b c "LPGA Yearly Scoring Leaders". About.com. Retrieved 28 December 2012. ^ a b "Full Career Biography" (PDF). LPGA. Archived from the original (PDF) on 25 March 2007. Retrieved 7 March 2007. ^ "1995 Australian Ladies Masters". ALPG Tour. Archived from the original on 10 February 2007. Retrieved 8 March 2007. ^ Thomsen, Ian (2 May 1996). "Golf Tour For Women Tees Off With Hope". International Herald Tribune. Retrieved 15 March 2007. ^ "Jerringpriset Award Winners". radiosporten. Archived from the original on 26 March 2007. Retrieved 8 March 2007. ^ "Trygg Hansa Ladies' Open". Golf in Europe. Archived from the original on 18 February 2007. Retrieved 8 March 2007. ^ "Sorenstam splits with longtime caddie". Golf Today. Retrieved 20 February 2008. ^ Sirak, Ron (28 July 2007). "All The Action Isn't at the Golf Course". Golf Digest. Retrieved 20 February 2008. ^ Hanson, Tom (13 March 2000). "Sörenstam deserves Hall pass". Sports Illustrated. Retrieved 8 March 2007. ^ "Annika Sörenstam bio". LPGA. Retrieved 9 November 2014. ^ "Annika, Price Inducted into Hall". The Golf Channel. 21 October 2003. Retrieved 8 March 2007. ^ a b Sawyer, Alison (18 October 2004). "Women's Sports Foundation". Women's Sports Foundation. Archived from the original on 8 October 2008. Retrieved 18 May 2008. ^ "World Golf Hall of Fame Profile: Annika Sörenstam". World Golf Hall of Fame. Retrieved 4 September 2013. ^ Chu, Jeff (26 May 2003). "Annika's Driving Ambition". Time. Retrieved 3 May 2007. ^ "Sörenstam reaches golf's magic number". ESPN. 21 March 2001. Retrieved 8 March 2007. ^ Slater, Matt (6 December 2002). "All hail Queen Annika". BBC Sport. Retrieved 5 December 2007. ^ Brown, Clifton (1 April 2002). "Golf; Statement Made by Sorenstam, And Fashion Is the Least of It". The New York Times. Archived from the original on 31 January 2013. Retrieved 30 March 2010. ^ "Tournament Summary Report for 2002 ANZ Ladies Masters". ALPG Tour. Archived from the original on 10 February 2007. Retrieved 8 March 2007. ^ Park, Martin (18 August 2002). "Sörenstam by five". LET. Archived from the original on 30 September 2007. Retrieved 8 March 2007. ^ "Annika Sorenstam – 2003 – Back in Time: May 22". Sports Illustrated. Retrieved 21 May 2011. ^ Potter, Jerry (12 May 2003). "Singh says Annika 'doesn't belong' on PGA Tour". USA Today. Retrieved 5 December 2007. ^ Potter, Jerry (13 May 2003). "Singh backs off comments about Sorenstam". USA Today. Retrieved 5 December 2007. ^ "An Interview with Annika Sörenstam". Golf Magazine. 22 May 2003. Archived from the original on 24 May 2003. Retrieved 1 July 2008. ^ "Annika Sorenstam tees off in a PGA event". ESPN. 22 May 2003. Archived from the original on 3 November 2012. Retrieved 31 May 2009. ^ Park, Martin (3 August 2003). "Annika slam dunks the opposition". LET. Archived from the original on 30 September 2007. Retrieved 10 March 2007. ^ "Grand Slam". LPGA. Archived from the original on 22 February 2007. Retrieved 8 March 2007. ^ "December 01, 2003: News and Notes". LPGA. Archived from the original on 29 September 2007. Retrieved 11 May 2007. ^ "Annika Sorenstam Biography". Athletes for Hope. Archived from the original on 4 September 2011. Retrieved 28 December 2012. ^ Farrell, Andy (18 December 2003). "Annika wins Golfer of the Year". LET. Archived from the original on 25 October 2006. Retrieved 8 March 2007. ^ "All Time Records" (PDF). LPGA. Archived from the original (PDF) on 15 April 2007. Retrieved 2 April 2007. ^ "Annika Sörenstam Laureus Win". Laureus World Sports Academy. Retrieved 28 December 2012. ^ "Annika's way: Instruction kept simple as swing". Sports Illustrated. 5 October 2004. Retrieved 10 March 2007. ^ a b "Annika Sörenstam files for divorce". Golf Today. Retrieved 31 January 2009. ^ "After her divorce, Sörenstam is moving on". PGA of America. 18 December 2005. Archived from the original on 23 December 2005. Retrieved 24 June 2008. ^ Cutler, Bethan (13 June 2005). "Annika wins the LPGA Championship". LET. Archived from the original on 30 September 2007. Retrieved 11 March 2007. ^ "Sörenstam gets historic fifth win". BBC News. 6 November 2005. Retrieved 8 March 2007. ^ Cutler, Bethan (7 August 2005). "Annika wins the Scandinavian TPC Hosted by Annika". LET. Archived from the original on 30 September 2007. Retrieved 8 March 2007. ^ "Rolex Player of the Year Winners". LPGA. Archived from the original on 27 October 2006. Retrieved 7 March 2007. ^ "Sybase Match Play Championship celebrates players with most wins". LPGA. Archived from the original on 15 August 2010. Retrieved 15 December 2010. ^ "1990–2003 Solheim Cup Teams" (PDF). LPGA. Archived from the original (PDF) on 16 June 2007. Retrieved 10 March 2007. ^ "The 2005 European Solheim Cup team announced". LET. Archived from the original on 24 October 2012. Retrieved 28 December 2012. ^ "Internationals secure win in Inaugural Lexus Cup". Lexus. Archived from the original on 24 January 2007. Retrieved 10 March 2007. ^ "Woods, Sörenstam, Irwin Win GWAA Awards". The Golf Channel. 18 December 2002. Archived from the original on 27 September 2007. Retrieved 13 April 2010. ^ "Singh, Sörenstam, Stadler Win Writer Awards". The Golf Channel. 14 December 2004. Retrieved 8 March 2007. ^ "Woods, Annika, Quigley Win Golf Writers Awards". The Golf Channel. 12 December 2005. Retrieved 8 March 2007. ^ "Sörenstam wins award by wide margin". ESPN. 29 December 2003. Retrieved 10 March 2007. ^ Litke, Jim (28 December 2004). "Sorenstam voted repeat AP Female Athlete of Year". USA Today. Retrieved 5 August 2008. ^ "Golfer Sörenstam chosen AP female athlete of the year". CBC (Canadian Broadcasting Corporation). 28 December 2005. Archived from the original on 25 January 2007. Retrieved 10 March 2007. ^ "Annika honoured again with Top Award". LET. 13 December 2005. Archived from the original on 30 September 2007. Retrieved 8 March 2007. ^ "The 2005 ESPY Awards". ESPN. Archived from the original on 26 February 2007. Retrieved 8 March 2007. ^ "The ESPY Awards 2002 winners". ESPN. Archived from the original on 9 February 2007. Retrieved 10 March 2007. ^ "The ESPY Awards 2003". ESPN. Retrieved 10 March 2007. ^ "The 2004 ESPY Awards winners". ESPN. Archived from the original on 4 March 2007. Retrieved 10 March 2007. ^ "Rolex Women's World Golf Rankings Unveiled". LPGA. 21 February 2006. Archived from the original on 29 April 2007. Retrieved 9 May 2007. ^ "Rolex Women's World Golf Rankings". Rolex. Archived from the original on 13 March 2007. Retrieved 10 March 2007. ^ Vlismas, Michael (23 January 2006). "Sörenstam leads Sweden to World Cup victory". LET. Archived from the original on 27 September 2007. Retrieved 8 March 2007. ^ "Annika Sörenstam unsure about cause of lack of form". Golf Today. 7 June 2006. Retrieved 8 March 2007. ^ Ferguson, Doug (3 July 2006). "Sörenstam rolls past Hurst to win U.S. Women's Open playoff". USA Today. Retrieved 8 March 2007. ^ Farrell, Andy (30 July 2006). "Annika the Tigress has text appeal". London: The Independent Newspaper. Retrieved 8 July 2008. ^ "Annika – queen of the desert". LET. 29 October 2006. Archived from the original on 27 September 2007. Retrieved 8 March 2007. ^ Cutler, Bethan (13 August 2006). "Sörenstam completes brilliant Swedish title defence". LET. Archived from the original on 27 September 2007. Retrieved 8 March 2007. ^ "Asia clinch victory in Lexus Cup". BBC Sport. 17 December 2006. Retrieved 7 July 2007. ^ "Francella bests Sörenstam in MasterCard playoff". USA Today. 13 March 2007. Retrieved 16 April 2007. ^ Long, Mark (13 April 2007). "With Sörenstam out, Ochoa takes aim at No. 1 ranking". Daily Journal. Archived from the original on 29 September 2007. Retrieved 19 February 2008. ^ "Annika Sorenstam withdraws from Ginn Open". LPGA. Archived from the original on 3 February 2008. Retrieved 5 December 2007. ^ "Annika diagnosed with ruptured disk, bulging disk". ESPN. Retrieved 5 December 2007. ^ "Ginn Tribute hosted by ANNIKA Pre-tournament interviews". LPGA. Archived from the original on 21 September 2007. Retrieved 4 July 2007. ^ Batten, Sammy (2 July 2007). "Annika disappointed with effort". The Fayetteville Observer. Archived from the original on 22 October 2007. Retrieved 4 May 2010. ^ "Matthew earns fifth win with Scandinavian TPC victory". ESPN. 12 August 2007. Retrieved 19 August 2008. ^ "Sorenstam knocked out of ADT Championship". Golf Magazine. 16 November 2007. Archived from the original on 3 May 2008. Retrieved 10 June 2008. ^ "Sorenstam retains Dubai Ladies Masters title". LET. 16 December 2007. Archived from the original on 20 December 2007. Retrieved 17 December 2007. ^ "Sorenstam takes SBS Open for 70th LPGA title, first since 2006". ESPN. 16 February 2008. Retrieved 28 May 2008. ^ "Sorenstam, Creamer question Wie's decision". Golf Magazine. 29 July 2008. Archived from the original on 20 August 2008. Retrieved 18 July 2009. ^ Litsky, Frank (14 May 2008). "Annika Sorenstam Announces Retirement". The New York Times. Retrieved 12 September 2018. ^ "Annika Announces Decision to 'Step Away' from Competitive Golf at End of Season". LPGA. 13 May 2008. Retrieved 13 May 2008. ^ "Team International wins the Lexus Cup 2008". LPGA. 30 November 2008. Retrieved 31 January 2009. ^ a b "Sorenstam: "I'm Stepping Away" – 05/13/2008". The Golf Channel. 13 May 2008. Retrieved 13 May 2008. ^ McGrath, Chris (31 July 2008). "Annika Sorenstam: Motherhood beckons for Swedish star". The Independent. London. Retrieved 31 January 2009. ^ "Sorenstam launches official website". LPGA. Retrieved 31 January 2009. ^ "Annika Sorenstam launches Blog". LPGA. 14 November 2007. Retrieved 31 January 2009. ^ Sirak, Ron (13 November 2006). "Annika's beau to help build her brand". Rhode Island Golf Association. Archived from the original on 18 May 2008. Retrieved 5 December 2007. ^ "Annika Course". Mission Hills Golf Club China. Archived from the original on 27 September 2007. Retrieved 31 January 2009. ^ "Sörenstam launches golf course in South Africa". LPGA. Archived from the original on 29 September 2007. Retrieved 16 April 2007. ^ "Annika Sorenstam officially opens Euphoria Golf Estate & Hydro" (PDF). Euphoria Golf Estate & Hydro. Archived from the original (PDF) on 25 March 2009. Retrieved 31 January 2009. ^ Cunneff, Tom. "Charting a New Course". Links Magazine. Archived from the original on 6 October 2008. Retrieved 22 July 2008. ^ "Yet-to-Be Details of Olympic Golf". The New York Times. Retrieved 18 August 2012. ^ Inglis, Martin (10 October 2017). "Annika Sorenstam battling gender stereotypes in golf course design". bunkered. ^ "Annika Sörenstam announces golf academy to open at Reunion Resort & Club". LPGA. 31 October 2006. Archived from the original on 12 February 2009. Retrieved 31 January 2009. ^ "Annika Sörenstam Becomes National Ambassador for Make a wish foundation". Make-A-Wish Foundation. 11 April 2007. Archived from the original on 3 May 2007. Retrieved 11 May 2007. ^ "Annika Sorenstam and AJGA jointly create The Annika Invitational". World Golf. 15 October 2008. Retrieved 31 January 2009. ^ "Simin Feng Wins by a Whisker". American Junior Golf Association. 2009. Archived from the original on 1 February 2009. Retrieved 31 January 2009. ^ "Annika Sorenstam to keep swinging for Cutter & Buck". The Seattle Times. 19 October 2005. Retrieved 28 December 2012. ^ "Annika and Wente Vineyards". Archived from the original on 16 November 2011. Retrieved 28 December 2012. ^ "Annika Sorenstam to have a signature fragance by SA Fragrances". World Golf News. 21 November 2008. Retrieved 14 December 2008. ^ "Annika Cooking at Wegmans". LPGA. Retrieved 4 April 2007. ^ "Ming Tsai and Annika Sorenstam". Travel and Leisure. Retrieved 28 December 2012. ^ "Annika is Cookin' Up a Storm". The Golf Channel. 15 January 2003. Retrieved 10 March 2007. ^ Allen, Dave (1 August 2005). "The Golf Magazine Interview: Annika Sörenstam". Golf Magazine. Archived from the original on 13 February 2009. Retrieved 28 October 2008. ^ "Annika Sörenstam rang the Opening Bell at the New York Stock Exchange". LPGA. 17 August 2006. Retrieved 19 February 2008. ^ Lovan, Dylan T. (30 December 2006). "Atheists say they've been threatened over their views". The Florida Times-Union. Associated Press. Retrieved 29 June 2013. ^ "Pro Husband". Sports Illustrated. 31 August 1998. Archived from the original on 18 February 2009. Retrieved 31 January 2009. ^ Neal, Laura (19 June 2002). "In conversation with Annika". LET. Archived from the original on 18 May 2008. Retrieved 31 January 2009. ^ "Sorenstam engagement 'a lovely surprise'". PGA Tour. 25 August 2007. Archived from the original on 12 February 2009. Retrieved 31 January 2009. ^ Sirak, Ron (23 November 2007). "Newsmakers 2007: Annika Sorenstam". Golf World. Archived from the original on 12 February 2009. Retrieved 31 January 2009. ^ "Annika Sorenstam marries Mike McGee". Yahoo News. 10 January 2009. Archived from the original on 14 January 2009. Retrieved 31 January 2009. ^ "Sorenstam expecting first child". ESPN. Associated Press. 10 March 2009. Archived from the original on 21 March 2009. Retrieved 20 March 2009. ^ "Annika Sorenstam unexpectedly has second child". NBC Sports. Archived from the original on 30 April 2011. Retrieved 25 March 2011. ^ Weinman, Sam (23 March 2011). "Sorenstam's harrowing childbirth experience". Golf Digest. Retrieved 31 October 2016. ^ "Women's World Golf Rankings". 31 December 2006. Retrieved 8 April 2013. ^ "Women's World Golf Rankings". 31 December 2007. Retrieved 8 April 2013. ^ "Women's World Golf Rankings". 31 December 2008. Retrieved 8 April 2013. ^ Sörenstam, Annika (February 2009). "Annika's Blog February 2009". Annika Sörenstam. Archived from the original on 24 March 2009. Retrieved 2 March 2009. ^ "Princess Royal among first women to join St Andrews". BBC Sport. 10 February 2015.